"No Idea has ever been fulfilled in this world, except through an ordeal of sufferings and sacrifices. "~Netaji Subhas. "Forget not that, the greatest curse for a man is to remain a slave! Forget not, that, the grossest crime is to compromise with injustice and wrong. ..." ~Netaji Subhas. "Remember the eternal law, that, you must give life if you want to get it. And, the highest virtue is to battle against inequity and wrong, -no matter that the cost may be." ~Netaji Subhas. 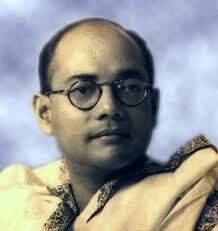 "In this mortal world, everything perishes and will perish; but ideas, ideals and dreams do not...." ~Netaji Subhas.